What is the Power Smart Pricing program? Illinois was the first state in the country to launch a statewide residential real-time pricing program. The Power Smart Pricing (PSP) program offers Ameren Illinois customers a new way to pay for electricity, charging them a supply rate that can change on an hourly basis, instead of the standard price that stays the same 24/7. Power Smart Pricing has saved participants an average of about 15 percent on the supply portion of their electricity bills, although savings aren’t guaranteed. The program also helps reduce demand for expensive and pollution-causing power plants, and it can help prevent power outages by reducing stress on the electricity system during “peak” times, when power usage and prices are at their highest. The program is managed by Elevate Energy, a nonprofit organization dedicated to helping people save energy and money. Ameren traditionally charges residential customers fixed electric supply rates that change only twice a year. (See Ameren’s current fixed electric rate on the Electric page of CUB’s website, CitizensUtilityBoard.org.) But Power Smart Pricing customers pay a market price that can change every hour. The program uses “day-ahead” prices, meaning the price for each hour of the day is set the night before. 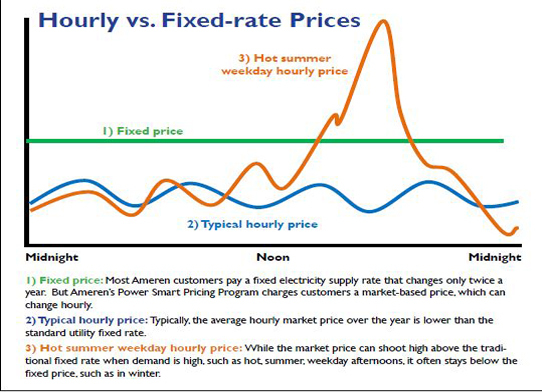 This price variability may sound scary, but for most of the year the hourly rate is lower than Ameren’s default fixed rate. How can I save money in the program? You can plan your energy usage by checking the “day ahead” prices available each evening online and by phone. Higher prices are most likely to occur during the summer, on hot weekday afternoons. If you opt to receive “High Price Alerts,” you will be notified the day before by email, phone or text message if the price will be 9 cents per kilowatt-hour (kWh) or higher. Power Smart Pricing also provides tips on cutting your energy costs and personalized online account information to track whether or not you are saving under the program. Is Power Smart Pricing right for me? 1) Consistently use above 350 kWh in a month or have a monthly electric bill that is more than $50. 2) Heat your home with electricity. 3) Own an electric vehicle (EV). Power Smart Pricing is perfect for people who want to take more responsibility for their electricity usage and are curious about how to cut their power bills by changing when they use their electricity. The program may not be right for customers who need to use their dishwasher or air conditioning often during peak-usage times, when the market price of power at that moment could be well beyond the regular utility flat rate. Program customers must have an advanced electric meter, also known as a smart meter. Advanced meters have a digital face and a yellow sticker. PSP customers pay a $2.25 monthly fee. Typical savings should more than cover the $27 annual cost. Will I be able to opt out? You can leave Power Smart Pricing at any time, but it’s a good idea to stay with the program for at least a year. Pricing patterns and your usage change with the seasons, so it’s best to evaluate the program after you have received 12 months of bills. If you leave the program, you can’t rejoin for a period of 12 months following the termination. How will my electric bill look different? While the taxes section of your power bill won’t change, there will be some changes to the delivery and supply sections. On standard bills, the supply charge is the number of kWhs used multiplied by the utility’s fixed electric rate. On your PSP bill, the Day Ahead Energy Charge is the amount of kWhs used multiplied by the corresponding hourly prices. The Real Time Pricing (RTP) Supplier Charge is a per kWh rate that is included in the supply charge on standard bills, but is separated out on a PSP bill. The RTP Supplier Charge rate changes every June and October. On standard bills, the Transmission Service Charge is based on total kWhs used. For PSP customers, the Transmission Service Charge is based on their individual use during the system peak hour, or one hour in the billing cycle in which electricity demand was highest across all Ameren Illinois territory. The Transmission Service Charge for PSP customers could be higher or lower than for customers on standard rates. You can reduce your Transmission Service Charge by using energy wisely when electricity demand and prices are high.